When you first get a gas grill, it can feel like the thing is indestructible. Turn on the propane, click the starter and fire it up – you are good to grill and good to go! But over time, you may start to notice a loss of performance. Even if you do not notice any particular problem, it is important to understand that various parts of your gas grill will wear out. And the more the grill is used – especially in commercial situations – the faster parts will wear out. With the cheap cost of many gas grills today, it can be tempting to throw out your old one and just go purchase a new one. But anyone who is passionate about grilling will tell you how economical it can be to repair an older grill versus buying a new one, and you may find that your older model, once repaired, cooks better than a new, inexpensive model. As long as you know what to look for, and you have access to some quality replacement parts that you can depend on, you should be able to get your grill fully operational again. 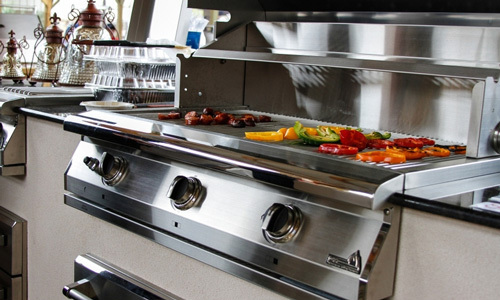 Replacing parts like burners, hoses, grates and the firebox is not difficult, and will do wonders for your grilling sessions – not to mention the safety of anyone who operates the grill. You might even find that your old grill, properly repaired and maintained, is worth more in the future than it was when you bought it! Gas grills are quite safe when maintained and operated according to the instructions provided. But as they are used and parts wear out or become fouled, safety can become an issue. You are operating an appliance that uses a flammable fuel, after all. Maintaining your grill and replacing broken, damaged and worn components are necessary to keep the grill operating safely. The grates in your grill are going to get dirty and require cleaning. Avoid using soap on your grates, instead, opting for a wire brush to scrape off dirt and grime. If you really want to take good care of your grates, clean them each time before you cook and then clean them after you cook. You can also oil them to keep them free of rust until you use them next. If the grates are so dirty and caked that they seem impossible to clean, or if they are bent and warped, replacement might be necessary. If you have porcelain grates that are cracking and chipping, they need to be replaced. You can use soapy water to check for gas leaks. Use a spray bottle to apply the mixture to gas connections and hoses; then turn on the gas tank or line. If you see bubbles, you have a leak. Try tightening connections to stop leaks. If you still have a leak, you need to replace the part that is leaking. The firebox sits under the burners, where it catches grease and food particles as the grill is used. Follow the manufacturer's instructions to clean the firebox. If you notice excessive rust or corrosion, it is time to replace the firebox. Burners that fail to put out a full flame can sometimes be cleaned using a toothpick or other small pointed object. But if cleaning does not improve the flame, then you need to replace the burners. Out of all the parts on gas grills, burners tend to be replaced most frequently. Many owners go looking for gas grill replacement parts from the retailer where they bought their grill, only to find that they cannot get the parts they need from the company that sold them the grill. If you own an AEI PGS Grill, you can get replacement parts directly from AEI. You can quickly find your grill parts on the AEI website, and order exactly what you need with only a few mouse clicks. Contact AEI today to get your gas grill replacement parts!